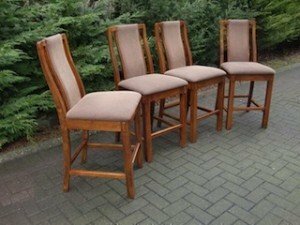 A set of four solid oak high back breakfast bar chairs, upholstered to the seat and backrest in camel velour. 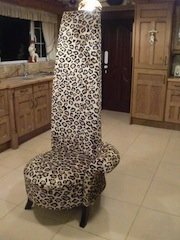 A contemporary high back, one arm dining chair on short mahogany legs, upholstered in leopard patterned velour. 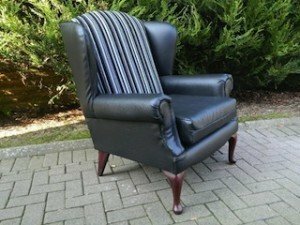 A high back gentleman’s armchair of mahogany legs, upholstered in black faux leather and striped fabric. 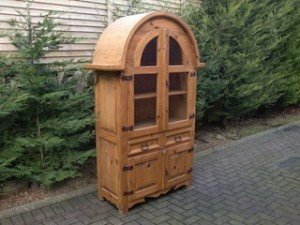 A solid pine rounded top country kitchen dresser, having two glass panelled doors above two drawers and a double cupboard. 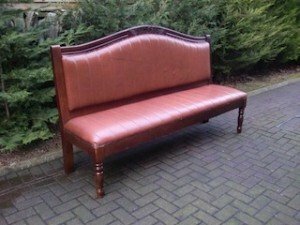 A vintage mahogany long bench with carving detailing to the top, upholstered in terracotta leather. 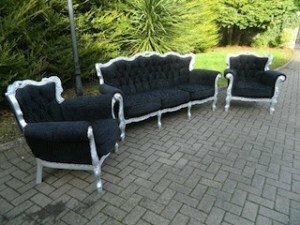 A three piece hand painted silver and heavily carved sofa suite, includes a three seater sofa and two matching armchairs. 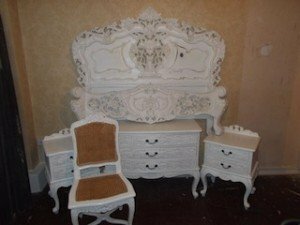 A collection of hand painted white furniture in the shabby chic style, includes a double bed frame, a pair of bedside drawers, a large chest of drawers and a hall chair. 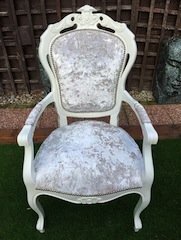 A heavily carved solid wood hall chair, hand painted white and upholstered to the seat, backrest and armrests in silver velour. 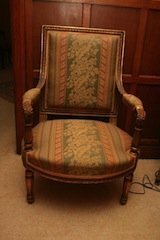 A vintage mahogany spoon back hall chair on carved legs, upholstered in mustard striped fabric. 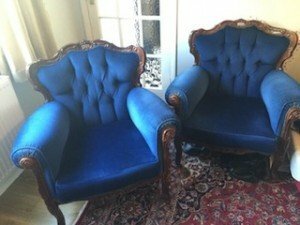 A pair of Chesterfield heavily carved mahogany armchairs, upholstered in blue velour with button back detailing. 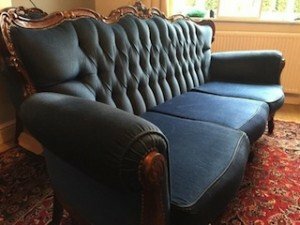 A heavily carved mahogany three seater Chesterfield sofa, upholstered in blue velour with button back detailing. 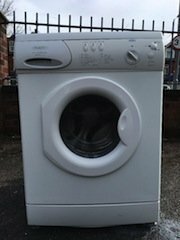 A white Hotpoint 1100 spin 6kg under counter washing machine. 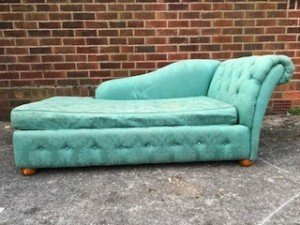 A vintage high back chaise lounge sofa on solid wood ball feet, upholstered in blue damask patterned satin. A white Indesit under counter 8kg tumble dryer. 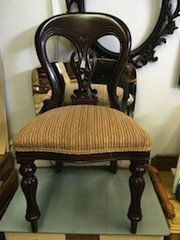 A heavily carved hand painted gold vintage hall chair, upholstered to the seat and backrest in striped and floral patterned fabric. 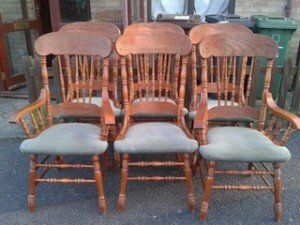 A set of six solid wood curved back dining chairs, upholstered to the seats in pale blue velour. 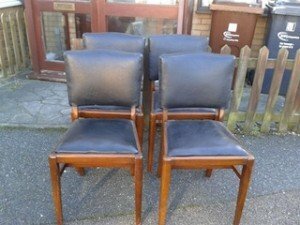 A set of four solid wood vintage high back dining chairs, upholstered to the seats and backrests in authentic black leather. 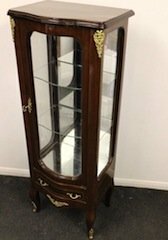 A vintage solid mahogany and brass inlaid display cabinet, having a glass door opening to reveal two glass shelves, having a mirrored back and a small drawer to the bottom. A hand painted white solid wood single dresser, having a small mirror above a drawer and cupboard. 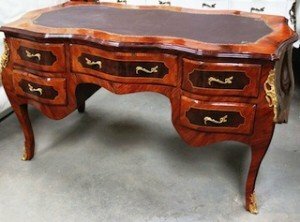 A vintage solid wood and brass inlaid carved desk, having two small drawers to either side of a central drawer.